On July 12 at the RAF Museum in Cosford, Aviramp staged an open day for customers and the press. This event was the company's third product showcase and gave attendees the opportunity to learn more about the business, the brand, the products and future developments. Those present saw the unveiling of the Aviramp Belt Loader, a much anticipated addition to the company's product suite, and which will form a third element of the pending turnaround kit. 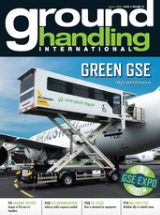 This is due to be launched this year and will comprise an Aviramp boarding ramp, belt loader and Aviramp air stairs... in short, a complete GSE solution. The open day also revealed the manufacturer's plans to open an office in the US as a direct response to the way in which US airlines and airports have embraced the Aviramp concept. Aside from the products, the event included some independent content, with the CAA's James Fremantle offering his views on the passenger experience, as well as a conference on the PRM perspective both in terms of boarding and on board the aircraft itself. This discussion involved Giles Baldwin from Birmingham airport, Jim Maunders from Swissport, James Fremantle from the CAA, Chris Wood from Flying Disabled, Andy Wright from Accessible Travel and was chaired by ProwAir's Simon Prower, formerly from Ground Operations at easyJet, and later Flybe.